ESA released the most detailed image yet of comet 67P/C-G captured by the Rosetta spacecraft on Aug. 3, just 300 kilometers (186 miles) away from the comet. Editor's update for Aug. 6: The European Rosetta spacecraft successfully arrived at its comet target on Wednesday, Aug. 6. For our latest story on the historic arrival, visit: Europe's Rosetta Spacecraft Makes Historic Arrival at Comet. The European Space Agency's Rosetta spacecraft is closing in on a comet 4 billion miles (6.4 billion kilometers) from Earth, snapping the most detailed photos yet of the icy celestial wanderer. And the view is only going to get better. Only two days remain before the Rosetta spacecraft makes its historic arrival at Comet 67P/Churyumov–Gerasimenko on Wednesday (Aug. 6), and the probe's cameras are already revealing surprising details of the deep-space object. Shown here are three new photos from Rosetta's navigation camera, which captured the views on Sunday (Aug. 3) from a distance of just 186 miles (300 kilometers). Rosetta used its infrared spectrometer to take the temperature of its target, revealing that the comet is too hot to be covered in ice. Even though its average surface temperature is about minus 94 degrees Fahrenheit (minus 70 degrees Celsius), the comet is about 345 million miles (555 million kilometers) from the sun, where sunlight is about one-tenth as bright as it is here on Earth. From that distance Comet 67P/C-G is about 20-30 degrees C too warm to be completely coated in ice. Comet 67P/C-G's surface features appear sharper in Rosetta's full-frame photo seen here. Ground-based observations of the comet have revealed that its surface is not very reflective, suggesting that it is likely not coated in ice. The temperature readings from Rosetta confirm what astronomers suspected: the surface must be dusty since darker material absorbs more heat than reflective ice. However, this doesn't rule out the existence of ice. ESA scientists think it's likely that the comet still has splotches of ice covering its surface. Astronomers hope the Rosetta mission will provide insight into how well the comet conducts heat and the density and porosity of its surface. Rosetta will be the first spaceraft ever to orbit a comet. It will finally catch up with 67P/C-G on Wednesday 10 years after launching into space. Rosetta is expected to remain in its orbit around the comet until the end of 2015. 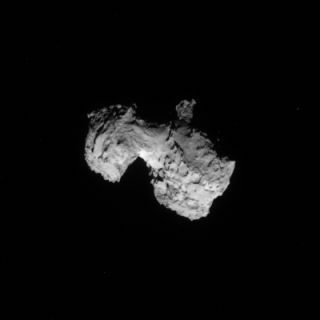 Visit Space.com this week for complete coverage of Rosetta's arrival at Comet 67P/Churyumov–Gerasimenko on Wednesday (Aug. 6) at 4:45 a.m. EDT (0845 GMT). Follow Kelly Dickerson on Twitter. Follow us @Spacedotcom, Facebook or Google+. Originally published on Space.com.